It's highly likely that 2004 is going to go down in video game history as the year of the first-person shooter, thanks to the release of two of the most important such games of all time, Half-Life 2 and Doom III (should the former ever actually make it onto the shelves!). Well that statement can only be compounded by this latest Ubisoft release, as, well before the release of either games - and also backed up by considerably less hype - Far Cry is already showing us what the evolution of the genre has on offer. And it's darn impressive. Developed by the relatively new German outfit Crytek, and built on the company's proprietary CryENGINE, the game is a tactical FPS, which tells the story of one Jack Carver (now you must read that name in the voice of the guy who narrates all the Hollywood film trailers). Having left his mysterious and bitter past behind him and now resigned to running a boat charter business in the South Pacific, Jack is hired by Valerie Constantine to take her secretly to an uncharted island in Micronesia. After Valerie is delivered safely, Jack's boat is suddenly attacked by mercenaries, leaving him stranded in the middle of nowhere, and with a friend lost in the depths of the jungle. And so the adventure begins, as you take on the role of Jack Carver (Jack Carver!) armed only with a gun and bestowed with the tasks of exploring a merc-filled island paradise, rescuing the aforementioned lady-friend and escaping alive. Oh, and shooting a hell of a lot of bad guys. Within not much time at all the plot takes an even more sinister twist, as Jack soon uncovers a whole load of Resi Evil-style experiments, bizarre mutations and hideous monsters. 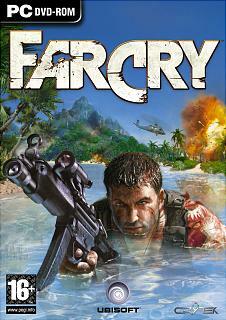 Now if Far Cry is intended to be a showcase for the developer's game engine then it's certainly doing a great job. Doing justice to the tropical island setting, the game boasts lushly rendered jungles and beautiful water effects, along with high detailed textures, an impressive draw distance and some fantastic lighting. There's a heavy emphasis on authentic physics throughout, with all objects in the game world acting faithfully, resulting in things like trees swaying in the wind and bodies sliding down hillsides. The CryENGINE is also capable of delivering some truly impressive AI, with enemies reacting believably to your presence, ducking out of the way, calling for backup and, in some instances, sneaking up behind you. One particular notable moment sees a helicopter relentlessly circling the tree that your hiding behind, as the gun-wielding passenger attempts to get you in his targets. If there's one qualm about Far Cry then it's the fact that all the rendering, physics calculations and AI algorithms demand a great deal of processing power and, as such, the game doesn't boast very forgiving system requirements. But it seems that this is becoming the case with PC gaming and, if you are in need of an upgrade, then now is the time to do it.